Timor Ponies evolved on the Indonesian island of Timor, probably from Indian breeds that were imported to the island. On Timor these ponies are mainly used for cattle work, as well as for riding, driving, and light farm work. Timor Ponies are described as being strong, frugal, and agile, and are lovely natured and intelligent. They have a narrow frame, short back, muscular neck, prominent withers, and a sloping croup. Their shoulders are straight, and the legs and feet are strong. Timor ponies usually stand 10-12 hands high (between about one and 1.2 meters), and are usually brown, black or bay, but may also be grey. They sometimes have a light colored mane and tail. 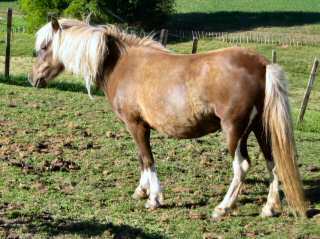 During the first half of the nineteenth century, a number of these ponies were imported into Australia, where they have had considerable influence on the development of Australian breeds, such as Walers and Coffin Bay ponies. Timor ponies appear to have had a long history in New Zealand. Back in the nineteenth century, they were listed for sale in newspaper advertisements as early as 1843, and a William Henry Valpy reported in a letter to the editor of the Otago Witness that he rode one on a six-day journey from Christchurch to Dunedin in May 1851. However, it is not known if the early introductions survived as a breed. It is thought that others came into New Zealand more recently as circus ponies with some travelling circus troupes about the 1950s. Some of these were abandoned or released into the wild, where they interbred and became the forefathers of the Timor ponies in this country today.